I love being a fangirl. I do. It occured to me last night whilst reading some fanfiction and having a glass of wine how lucky I am. Where do people's interest take them? If your interest n politics (which mine often is) then it has been my experience that you are left frustrated, outraged, sad, and often just plain tired. Even the victories can be fleeting a best, because in the end everything is a compromise. Mike, by significant other, is into Star Wars, and hours fly by - in books and video games, comics and tv shows. All in his room, alone. He seems happy enough, but always by himself. 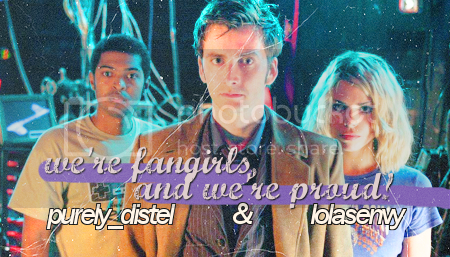 I am a fangirl, and I love every minute of it. I love the new shows. I love talking about the show. I love all of the peopel I meet and have made friends with, as they are among the warmest, most accpting people I've ever met in my life. If you grew up as lonely and misunderstood as I did, you would understand. If you didn't, thank goodness because n one should. I love that my fandom has inspired me to travel to an entirely other country where I've never been! I love that there are friends meeting me there. I love that I have never once felt judged for my flamboyant geekiness, and have only felt one of the girls which is a wonderful feeling indeed. I love that I have never felt anything but happy in the communities, and happiness isn't something I come by too easily. Because in case I haven't really pointed in out, I love being a fangirl. I really do. *hugs hard* It probably does not surprise you to hear that I feel the same in every aspect. I have met the most amazing people thanks to being the quirky fangirl I am, I spend the most amazing nights, days, weeks with those people or "in" my fandom and I am thankful for every little bit. You made me blush with those words and smile like a mad woman. I am so sure that we're going to have a wonderful time in London in a few months. *hugs aain* Can't wait to finally meet you for real! While we're at it. The hostel will send me an application form now. Did you get yours already?! I hope that we even end up in the same hostel! I can't begin to tell you how happy you have made her. Thanks. oh, hi! Who ever you are *laughs* I am glad that I am able to make someone happy that makes me sososo happy as well! I can't wait to meet her. this is all so amazing!!! Thats my um, significant other.